I'm an old tree and I'm okay with it. Photo credit: http://www.catpaisatge.net. 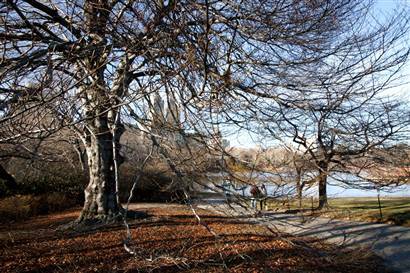 "When I was about 37 or 38, and beginning to feel 'older', I was walking one day with my daughter through Central Park. All the while I was whining and complaining to myself about minor creaks and aches I thought I had, about getting older, uglier, perhaps sicker, about how I wasn't like I used to be. At one point I looked up, and saw a large, beautiful, old tree. As I admired it, I distinctly 'felt' or 'heard' some communication coming from the tree to me. This is what it said: 'Come over here. You are admiring me now. Look at my wide branches, there is plenty of room for birds to play, to put their nests here. I give lots of shade to heat-weary travelers I add oxygen to the air, even protect you from the wind if necessary. I am useful -- but I am old. My branches are gnarled, my bark is full of holes and pieces have fallen off. I look wrinkled, not pretty. You want pretty, you want smooth? Look around, there are the young ones, smooth and pretty - but they're good for nothing right now. There is not enough room yet in their branches for the birds, they barely make some shade. What counts is function -- how you're doing, what you're doing for others -- not form. Remember that. '"!